Find the Best Prices – There are a number of place you can search for cheap hotel rooms. A few places to start with are Quikbook, Hotels.com, and Orbitz. Find the Best Quality – You can get hotel reviews from a number of places, but the gold standard in my mind is TripAdvisor. The reviews are aggregated from a number of users – in much the same way Amazon’s reviews are. Many minds working together make TripAdvisor a crowdsourcing success. It also gives estimated prices – making it one of the best places to start your hotel search. Search Ebay – You can get gift cards for hotel chains at Ebay. It could be a quick way to save 5-10% on your stay. Though the Ebay gift card tricks for any store, it’s worth mentioning. Name Your Own Price – If you’ve done the research above and found a couple of suitable places, why not try to undercut the published prices by naming your own price with Priceline? Look for Coupon Codes – Sites like Retail Me Not have discount codes for Marriott and other hotel chains. It’s worth a couple of minutes of entering codes. A Hotel Gym – I used to belong to Boston Sports Club. It was a fine gym – as long as you went to the one you signed up. If you went to another affiliated gym, you had pay a fee. 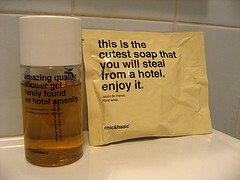 If your hotel has this amentity it can save you a few dollars. A Hotel With a Fridge and Microwave – Having a microwave available opens you up to all sorts of frugal dining options. Four words – Chef Boyardee / microwave popcorn. The refrigerator is great for saving leftovers. Even if you don’t have a microwave, you can save some milk and have cold pizza from the night before. Internet Access – My biggest pet peeve is that the more expensive, luxury hotels love to stick you with a $10 a day Internet access fee. However, if you go a discount Motel 6 or Red Roof Inn, it seems they almost always include Internet access. I like to call and ask specifically what the Internet policy is. Sometimes you find that becoming a member of the hotel’s loyalty club (which is free) gives you Internet access. The Omni hotel is one example of this. Get Free Breakfast – There are a lot of chains that offer free breakfast. It’s always worth checking to see if you can get this perk as it can put a few extra bucks in your pocket. Join Every Hotel Program – We belong to every hotel program there is. My wife travels for work (as previously mentioned) and when she can chooses to stay a Marriott resort (since we own a timeshare there). She not only picks up a lot of reward points, but since she stays nearly 50 days a year there, she has a special membership and has special privileges. It takes only a few minutes to sign up for almost every major hotel chain. I store all my hotel membership numbers in my cell phone so I have them available in my pocket at all times. Use Reward Points – It’s pretty straight-forward. If you’ve been doing the above, you may be working up enough over time to earn a free room here and there. Book a Cheap Room You Can Cancel – The concept here is to book the cheapest room possible as a safety room, but make sure that you can cancel it. A few days before you travel, you may find a preferred hotel has a sale. If so, you can book that and cancel your safety room. This is a little dirty and you may find that it against your morals. If that’s the case, don’t do it. I’m putting the idea out there. Military? Try Navy or Air Force Lodges – My wife is military. When we travel back home to Boston, we can stay at Hanscom Airforce Base for around $39 a night. You don’t get all the perks, but it comes with a nice bed, a refrigerator, microwave, and free Internet in the lobby. It’s everything we need when we are likely to be spending our time elsewhere. Check for Special Member Discounts – Government employees and AAA members get discounts. If you work for a big company, like General Electric, you may even find that they’re a special corporate rate for people that work there. I’m not sure if the corporate rate has to be for corporate business… but I’m not sure if they care. So there you have it… the best tips I could come up with. What are your tips for saving money on hotels? Drop me a comment below. Tripadvisor is great. Some people really let loose with info about negative experience (such as my wife after a recent nightmare stay in KC) and this can tell you a lot – especially if multiple users are having the same experience. You may also inquire about the availability of bacon for breakfast. Because if you don’t have bacon, what do you really have? Seriously, though, the free breakfast can save a lot of money. What would it cost to buy breakfast for a family of 4? Plus there is the convenience factor – you don’t need to make an extra trip to a restaurant. You can eat restaurant at the hotel and then when you jump into the car, you’re heading toward your main destination. I try to stay at Hiltons so I can pick up the reward points. So far I’ve reached their “Silver VIP” level (not that hard) and picked up one free night. By the end of next month, I will have enough points for 2 more free nights. I usually stay at Hampton Inn (a Hilton subsidiary) if at all possible. Their hotels are decent enough and have free Internet access and free breakfast. Sticking with one chain as long as it’s economically feasible is worth it to get the free nights over the long term. No joke! We stayed at a Hilton in Minneapolis for a school event, and I was PO’d that they charged something like $12 for 24 hours internet access. What a rip! You can also find deals on hotels, airfare and traveling by looking at websites that search and compile all the deals taking place online. One particular website that I’ve enjoyed using is called Cheaptweet. It scours the fast-growing world of Twitter for any deals and coupons that are being tweeted about and compiles them on their website. I recently had a work conference and stayed at the Signature at MGM Grand in Las Vegas. Booked through Expedia and got a great deal with airfare and hotel combined. In this economy deals are to be had! It was a beautiful room and the service was excellent. Sure beats the Imperial Palace where we usually stay! If using hotels.com, book thru ebates .com for cash back rewards. kind of off-topic, but which conference is your wife going to? APhA or ASCP? (I’m a pharmacist, and always trying to decide which conferences are most worth the very expensive registration fees). Seems lots of people are talking about saving money at hotels recently. I travel from Texas to L.A. at least once a quarter and after reading your post and a couple of other posts, I’m totally not getting the “good deals” I thought was getting! I had no idea Retail Me Not had coupons with Marriot and that’s where I stay. I love Marriot. I’m going to get the Marriot Amex card just so I can rack up points to travel with! But, I’m glad you posted on this because I’m getting ready to plan another trip and I want to save money on it where I can. Do you know if Retail Me Not has codes that work with Travelocity or Expedia? I usually use these sites to book with, so I’m just curious. We are Starwood Preferred Guests members and are returning to Vancouver in June. We discovered that a poshe hotel up the street could give us $70 a night cheaper for a better room than our preferred hotel from the Starwood Group, and they would throw in a $60 food and beverage credit. So I called the SPG hotel and asked for the Reservations Mgr. I kindly explained our dilemma – how we wanted to stay at his hotel, but in terms of cost, it wasn’t even a contest. I asked of there was a promotional or other price he would consider giving us. To my surprise, he gave is the cheapest, internet price on a regular room, upgraded us to a deluxe room and threw in our internet for free. Over 4 nights, that room saved us $260.00. Trip Advisor is dead on. My husband and I went to St. Lucia and read a lot of reports about the “all inclusive” resort we stayed at. The comments were dead on. The ski boat was from the 50’s and would only take you around the bay once and you could barely stand up! The food was terrible and we dreaded dinner every night. The room was OK but that was the best part! The people who comment on Trip Advisor are real. Cheap hotels San Francisco are better than the place we stayed at in St. Lucia. Take their advice! We just used the travel off season. We spent a week in Puerto Rico in the middle of July. It was great! The beaches weren’t too busy and the tickets were a great deal. Booking a month or more in advance give you saving on hotel rooms. I stayed in Canberra Australia last week and paid $165 for 2 bedroom room for 1 night,I booked with hotelless.com 6 weeks in advance. One week before I arrived at the hotel I checked the prices online at the same website and the same room was $250 per night.